A project full of firsts will help with the recovery and well-being of Taranaki people with experience of mental illness and addiction. 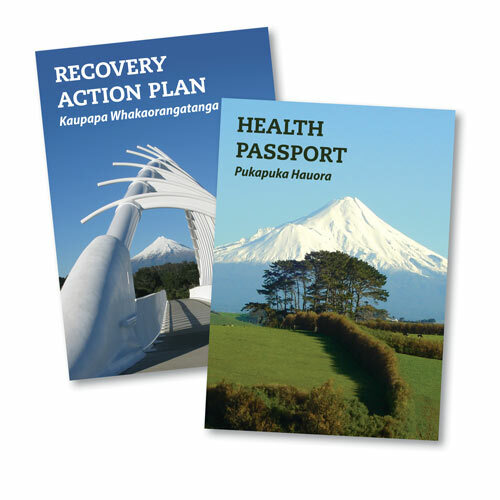 Project co-leader Nic Magrath says a new free booklet contains a Recovery Action Plan (Kaupapa Whakaorangatanga) at one side and a Health Passport (Pukapuka Hauora) on the other. The two-pronged booklet will be launched at 5.30pm on August 4, at the Baptist Church in New Plymouth. It has been put together by a large group of project advisers who have used or been involved with a mental health service. The booklet is new because in the past there have been one or two-page plans developed by clinicians for use in the different NGOs and the DHB mental health and addiction services. Magrath says the Recovery Action Plan for mental health and addiction and the Health Passport, which is about physical well-being, go together because of the many side effects from mental health medications. Project co-leader Jim Dickinson says that physical health problems can also contribute to mental health issues. The A4-sized booklet, emblazoned with a mountain image on the front and back covers, enables people to focus on their recovery, highlight any physical problems and also plan for the future, in case they become unwell again. “The whole idea of a plan is for people to take back control of their own physical and mental health,” Magrath says. Instead of being impassive participants the free booklet enables people to advocate for themselves and be aware of their triggers and early warning signs. “And what they need to do in order to stay well,” says Dickinson, family and whanau advisor for mental health at the TDHB. “We would give it to anybody who feels they would benefit from it,” he says. “It’s for the people of Taranaki,” Magrath adds. Extensive feedback from people using the booklet will also be sought. “We are launching it, but we are treating the first six months as a pilot so we can make sure it’s meeting people’s needs,” he says. The group is looking for people keen on helping out in the pilot. Once perfected, the idea is to develop a free app so people can have the recovery plan and passport on their phone. Magrath says the booklet is the first tool developed with the whole mental health and addiction sector involved. Before this, everyone had their own plan, which had different names and did different things. “People ended up disengaging because they had to do a different plan over and over again,” Dickinson says. Now what will happen is the one booklet will be available throughout Taranaki at Tui Ora, the TDHB, Pathways, Progress to Health, Needle Exchange Taranaki, the Salvation Army, Supporting Families in Mental Illness, Problem Gambling Foundation of New Zealand and from GP practices (Linkage). Along with these organisations, New Plymouth Injury Safe and the Taranaki Consumer Advisory Group also contributed to this project, which was funded by the Health Promotion Agency. While all these groups may be involved in a person’s journey to well-being, the Recovery Action Plan and Health Passport belong to the individual and it is for them to fill in. “We are encouraging people to take it to their GPs for help with the Health Passport side of things,” Magrath says. The passport is aimed at increasing people’s awareness of their physical health and encouraging those on mental health medications to have regular blood tests or checks. These plans are all about involving people in their own recovery and also their whanau members. The section for family to fill in clarifies subjects like cultural and religious beliefs, how whanau can be kept informed and what support they would like in times of need. When filling in the advanced directive a well person can make decisions about their care in case they become unwell. They can outline where they would look to go for treatment, who they want involved in their care and those they don’t, and which medications work and which don’t. Magrath says that ideally, the whole plan would be scanned and linked to an electronic file, easily accessible and adhered to when a person is so unwell they cannot advocate for themselves. “It should be a living document,” Dickinson says. The idea was originally developed by American Mary Ellen Copeland as a wellness recovery action plan. For further information, please contact Nic Magrath (TDHB Mental Health & Addictions Consumer Advisor) or Jim Dickinson (TDHB Mental Health & Family/Whānau Advisor) on 75 36 139 extension 8550.